This feature is the first of its kind focused on the past, present, and future development along the South Division Corridor. 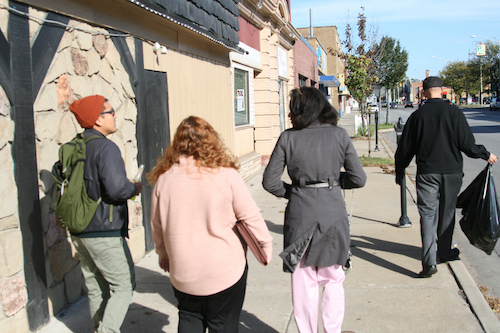 By taking an embedded journalism approach we will report on the steps, design process, advances, observations and community presentation of these resident-led and city-guided efforts. With a community-led project, residents, stakeholders, organizers and leaders of the South Division Corridor are initiating efforts to create an Area Specific Plan that prioritizes the longtime community members of the area. 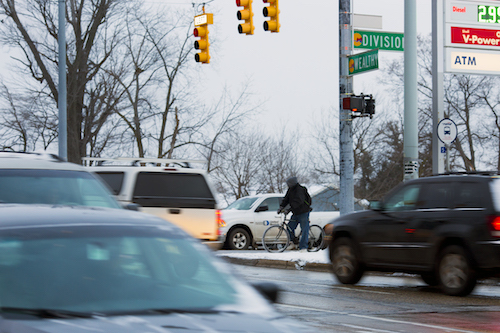 Through its position near the 131 highways, and proximity to the city of Wyoming and 28th Street, the South Division corridor acts as a point of contact for many coming in and going out of the city of Grand Rapids. 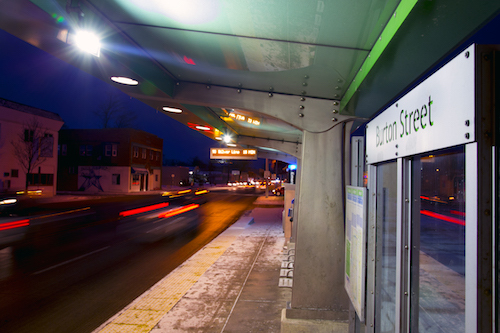 In the last decade, the area has seen an influx of purposeful investment, much of it driven by the Rapid’s Silver Line, a $40 million dollar project that travels along the corridor. As the area has gained more attention from outside entities, residents, leaders, stakeholders of the corridor are taking ownership to ensure the incoming development is equitable and representative of the needs of the community. South DivisionAngelica Velazquez has been a part of this community since she moved to Grand Rapids in 2001. That same year, her family grew from a family of eight to one of eleven when her sister died and her nieces and nephews came to live with her and her seven children. At the time, Velazquez lived in California, and did not feel confident she could raise eleven children on her own in a neighborhood she explains was greatly affected by violence. Angelica Velazquez, owner of La Casa de la CobijaIt was through word of mouth that Velazquez found herself in the Burton Heights and South Division area. She knew a friend of a friend who lived in Grand Rapids, and in an attempt to find a Latinx community, she stumbled with “Mexican-Town,” a term she uses in reference to the South Division Corridor. South Division CorridorThe South Division Corridor is the place where Velazquez realized her dreams of entrepreneurship; from the little grocery store, La Superior, she rented in the 2000 block of South Division in the mid 2000s, to taking her blankets, dresses, and textiles to sell at various flea markets in town, to what she now is most famously known for in the community, “La Casa de la Cobija” [The Blanket House] located on 2355 S. Division. To those using South Division to travel from the southeast side of town towards downtown or vice versa may assume La Casa de la Cobija is another business decorating the corridor, but little would they know about the woman who has single-handedly been able to build a successful business and community center. Though not an official community center, Velazquez hosts weekly fundraisers in her space for those in the community who are struggling and need financial support. Advocacy runs in her veins; before immigrating to the United States, Velazquez who is originally from Colima, a central western state of Mexico, she worked hard in local government to ensure property ownership for those with the least amount of financial resources. 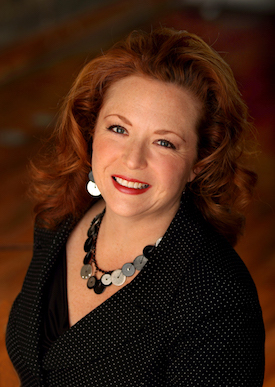 Thanks to her insistent advocacy, 200 people in her hometown became property owners. Velazquez knows the kind of power advocacy can have, and that is why she has most recently been advocating locally on behalf of her neighbors and community in the future development plans for the South Division Corridor. 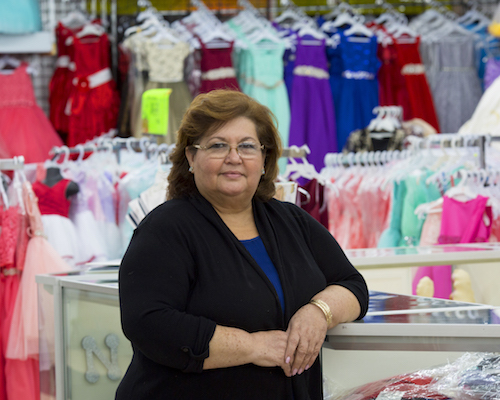 Because of her, two businesses, Tres Mangos de Michoacan and El Globo, decided to set up shop in the area. “La comunidad es tu familia,” [Community is your family] shares Velasquez, when asked why she has been engaging in the community outreach efforts that will be vital in helping develop the area’s specific plan. The South Division Development Plan is a plan focusing on Division Avenue from Wealthy Street to 28th Street and its surrounding blocks. For now, the plan is being called, Defining Division. Velazquez, who also serves as the leader of the Steering Committee—a group of residents, South Division leaders, organizers and business owners to the South Division Corridor and staff from the City Grand Rapids Planning department—has been meeting with the group since March 2017 to help develop the community engagement process necessary to create an Area Specific Plan for the South Division Corridor. According to Suzanne Schulz, Director of the Planning Department of Grand Rapids, Velasquez was a catalyst in forming the group and providing their expertise on planning to ensure a successful plan for the area. To Schulz, a successful plan for the area means community engagement and feedback from residents, business owners, and leaders of the Burton Heights and South Division corridor. Suzanne Schulz, Director of the Planning Department of Grand Rapids, Michigan“Calling the approach of this plan equitable involves giving a focus to how gentrification and displacement can occur in the redevelopment of an area, as well as other factors that shape community identity and quality of life,” shares Schulz. To Velazquez, a successful plan means her neighbors not only get a say in the development plans, they are not displaced in the process. As new business open, and new residents from the outside of the area move in, rents increase for shop owners and residents—all of which translates into longtime community members being forced to move out of the area because they can no longer afford to live there. For Van Drunen, an equitable plan in the South Division corridor is a framework that takes into consideration feedback and opinions from the community and sets the area for intentional investment for the next decade. 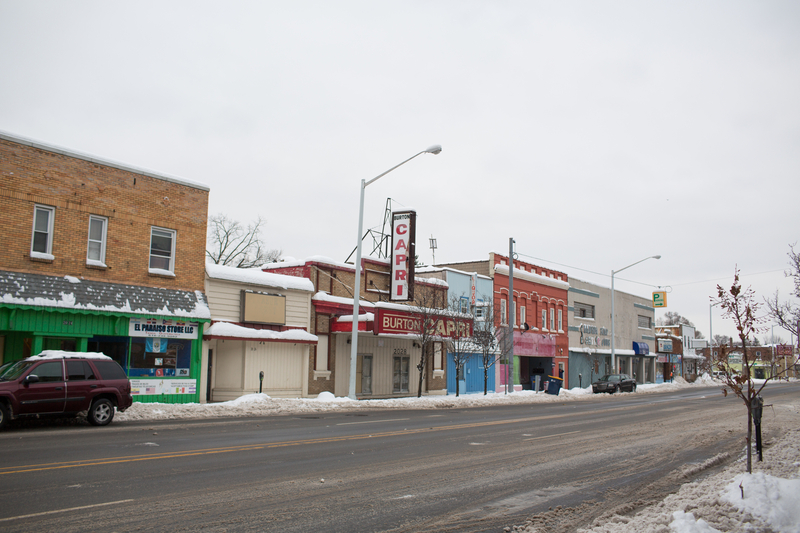 In the city of Grand Rapids, development has not had a focus on equity and minimizing displacement—as is the case of Wealthy Street, an area where in the 1980s and 90s was occupied by a majority of Black business owners and workers. Today, the area is mostly white. “We don’t want South Division to become another Wealthy street,” says Schulz. “The point of these meetings is to engage and educate the residents of the area on issues that affect them while providing them with an opportunity to give their voice,” shares Leonard Van Drunen, member of the advisory committee and owner of several buildings along the South Division Corridor. Van Drunen first became involved in this work informally through the Burtons Businessowner Association, and then was invited by the Planning Department to be a part of the Advisory Committee. In the last three years, Van Drunen has been investing in the neighborhood for the purpose of helping the neighborhood improve and change. 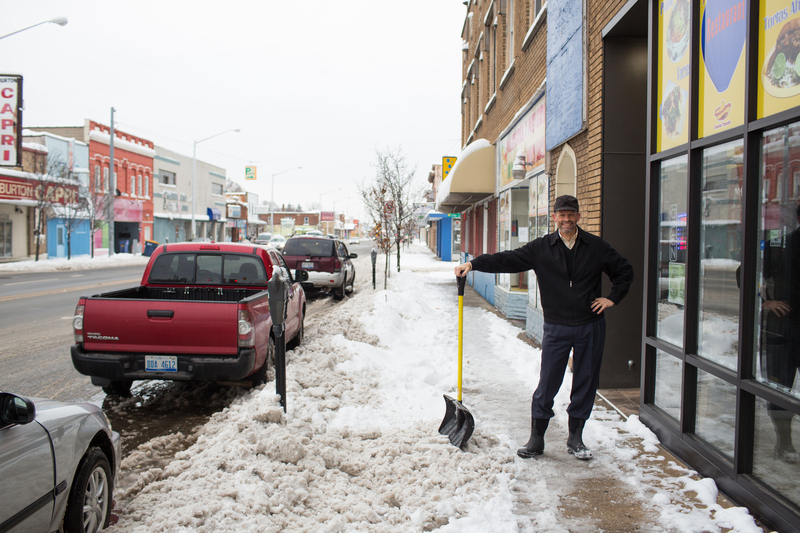 Van Drunen shovels the front of his building on 2019 S. Division, a retail spsace he rents to El Globo Restaurante. “People are what matter—if I do some development and it has a negative impact on people, then it is a fail,” responds Van Drunen, who attempts to lease each of his buildings to local individuals, businesses, or churches that will benefit the neighborhood. Within the defined boundaries of Defining Division, Latinx residents make up 59.3 percent of the area, Black residents 22.7 percent, and white residents 14.7 percent, and most of the residents being between the ages of 5 and 17 and 45 and 64, according to census data obtained from Johnson Center of Philanthropy at Grand Valley State University. In other words, Latinx residents make up the largest demographic in the area. Read about the history of the neighborhood here. Per U.S. Census data, about 40 percent of the population are renters and a little over 42 percent are homeowners. In the city, 68 percent of homes are owner-occupied and 31 percent are renter occupied. In both the South Division corridor and the city as a whole Black residents own the least amount of property, according to the U.S. Census Bureau. When asked to describes her community, Velazquez responds without hesitation: “We are compassionate, gentle, and hardworking people.” The people here mean everything to Velazquez and are the reason she is so desperate to ensure their voices are heard and their opinions are taken into consideration. “Mi mayor preocupación es que mi comunidad sea desplazada de su zona de confort, que le suban a los property taes y ellos se tengan que ir del vecindario,” says Velazquez [My greatest concern is for the potential displacement of my community from their comfort zone, that they raise property taxes and they are forced out of the neighborhood]. Schulz is adamant about this process being resident-led, and the city merely guiding the process. The process and proposed timeline for Defining Division will take place in the next two years in four distinct phases. Currently the process is in its introduction and early engagement phase, which will be followed by building community leadership, then plan development, and finally end with implementation. The phase involving building community leadership, according to Velazquez, will involve hiring Community Ambassadors to help gather feedback and involve neighbors, leaders, and stakeholders of the area in the process. The Community Ambassador is for people who work along the South Division Corridor or live in nearby neighborhoods to take a proactive role in the South Division Area Specific Plan process. 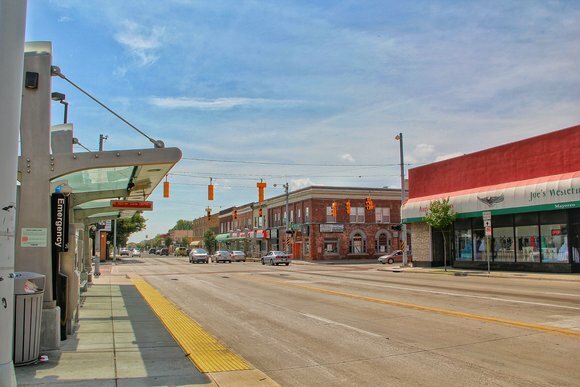 In many ways, Defining Division mirrors the community engagement component of Viva la Avenida, the area specific plan for the Grandville Avenue corridor. Viva la Avenida was adopted by the planning commission in early November of this year. Viva la Avenida was marketed as a plan by the residents and for the residents. Based on feedback from the community, the plan proposed keeping the area zoned for low-density housing to ensure apartment complexes do not take over. Read more about the plan here. In response to the plan, leaders of the neighborhood continue to advocate for neighborhood relationships between those developing and the organizations in charge to drive the future of development in the area. Area specific plans focus on neighborhoods, or blocks in the city of Grand Rapids, and act as amendments to the City’s master plan that was adopted in 1963. As Velazquez and Van Drunen look to the future of the South Division Corridor, they dream of increased walkability, diverse retail options owned by the community, a neighborhood library, affordable childcare in the neighborhood for residents, and places for youth of the community to belong. “Yo veo y conozco a gente de aqui y sus necesidades. No es simplemente sacar adelante a los hijos de uno pero a los hijos de todos nosotros. Es un orgullo vivir y pertenecer a esta comunidad,” says Angelica Velazquez, owner of La Casa de la Cobija [The Blanket House]. To get involved as an advisor in the Steering Committee for the South Division Area Specific Plan process or to find out more about the Community Ambassadors positions please contact Courtney Magaluk at cmagakaluk@grcity.us / 616-456-3585. This article is part of our Defining South Division Series, a monthly series over the next two years focusing on the community engagement and development process for the South Division Development Plan. We welcome your comments and feedback below. To connect with Michelle Jokisch Polo (read more about Michelle here), editor of this series, follow her on Facebook and Twitter. Defining South Division is made possible by the City of Grand Rapids, a local government organization working to foster a city where everyone is welcomed.